Maybe you already read my latest post, and you are a bit curious about which kind of cookies I brought to the cookie exchange in my neighborhood…. or maybe you are just looking for a special Christmas cookie recipe to amaze your friends, or just looking for a cheap and easy idea for fancy Christmas gifts. Well, in any case you are reading the right post! I’m going to share with you the recipe of “Cantucci” cookies, which are very popular Italian cookies that Americans commonly call “biscotti” without knowing that in Italy every kind of cookie is called “biscotti”, and then every different kind of “biscotti” has special name (for example: “savoiardi“; “pan di stelle“; “amaretti“; “lingue di gatto“; “brutti ma buoni” etc. etc.). 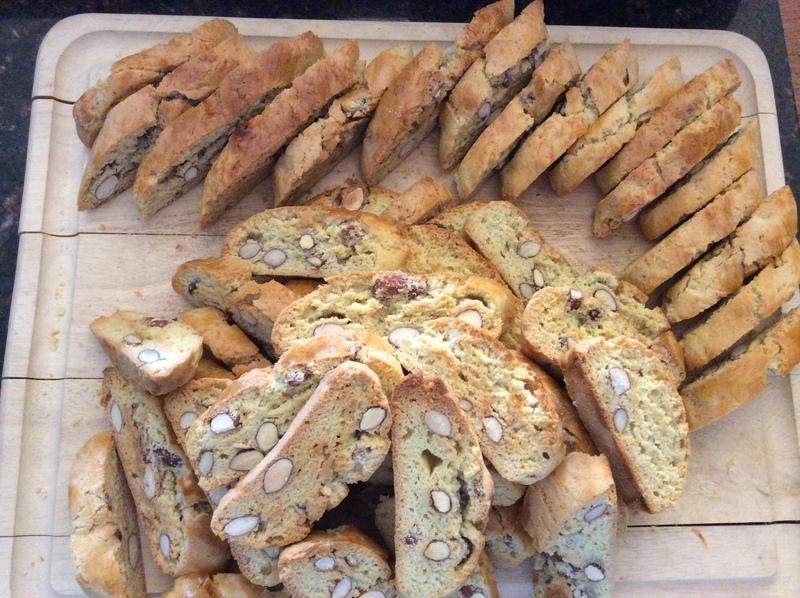 Cantucci are twice-baked biscuits originating in the Italian city of Prato (Tuscany). They are oblong-shaped almond biscuits, made dry and crunchy by cutting the loaf of dough while it’s still warm and fresh from the oven. I love to personalize them with different versions, like with almonds and raisins, or with almonds and chocolate drops. Since they look very nice and their taste is absolutely delicious, I’m preparing many cute cookies jar to give away to my friends as edible Christmas gifts! If you don’t have roasted almonds, just put your almonds in the oven for 5 minutes at 375 degrees, and then let them cooled off. In a bowl, whisk the eggs and the yolk with a pinch of salt and the sugar until they become white and fluffy. Then melt the butter and mix it with the eggs and sugar. Next sift the flour and add it gently to the mix. Add the almonds (or the almonds with the raisins, or the almonds with the chocolate) to the mix and stir gently. Then, at last, mix the baking soda with the apple vinegar and then add it to the dough, again stirring gently. Another option is add to the batter 16 gr. baking powder. Place the dough on a floured surface, and make 3 or 4 loaves. Place the loaves on one or two baking sheets, lined with parchment. Remember that they will raise a bit so place them at a reasonable distance, and brush them with a beaten egg. Bake at 375 F (190 C.) for about 20 minutes in the middle rack of your oven (since my oven is stronger at the bottom than at the top, after the first fifteen minutes, I usually flip the loaves upside down to brown them evenly). After the 20 minutes, take the loaves out of the oven, wait 2-3 minutes until they cool off a little, and then cut they in oblong slices. Place the obtained biscuits back in the oven for 15 more minutes at 340 F (170 C.). Tips: – Wait until the biscuits are completely cooled off before serving. – Cantucci (especially the “just almonds” version) are particularly crunchy, this is why in Italy they are served with a liquor (wine) called “Vin Santo“, and people enjoy them dipping Cantucci in this sweet liquor. I love eating them just like this, but they are delicious dunked in coffee or cappuccino or tea or (oh my goodness this could be really dangerous 😉 ) in hot chocolate! – If you go for the version with raisins, remember to soak the raisins in warm water for at least one hour before mixing them into the dough. – If you store Cantucci in a tin or a glass jar they can last a month.